I thought I’d just “make a salad” one hot day and then one thing led to another and I’m in the kitchen with my cast iron frying chicken and making candied pecans..so much for just an easy salad, right? However, I am super glad that I did! The flavors are just right, the textures are perfect together and since I got a pan out, I can consider this ‘cooking’ and write it up! I like to prep all my veggies/fruit first with this simple recipe. So that once I am finished frying up the chicken, all you have to do is toss it in a bowl together. So clean and chop your lettuces, hull and quarter your berries, and slice and dice your cucumbers and onion….Normally, I suggest buying premade candied pecans for ease, but I forgot. Soooo, I made some real quick by toasting my chopped nuts in a bit of oil in a skillet with a good dash of sugar and cinnamon. Tasted just fine. Onto the meat-of-the-matter, or in this case would it be poultry-of-the-matter?? Anyway, have three dishes ready and 2 plates (1 plate for the precooked/coated chicken and the other for the finished chicken). In your first dish, add a cup of flour and sprinkle liberally with salt and pepper. In your second dish, beat your one egg with a tbsp of cold water till frothy. In your third dish, add a cup of Panko breadcrumbs and also sprinkle with salt and pepper. 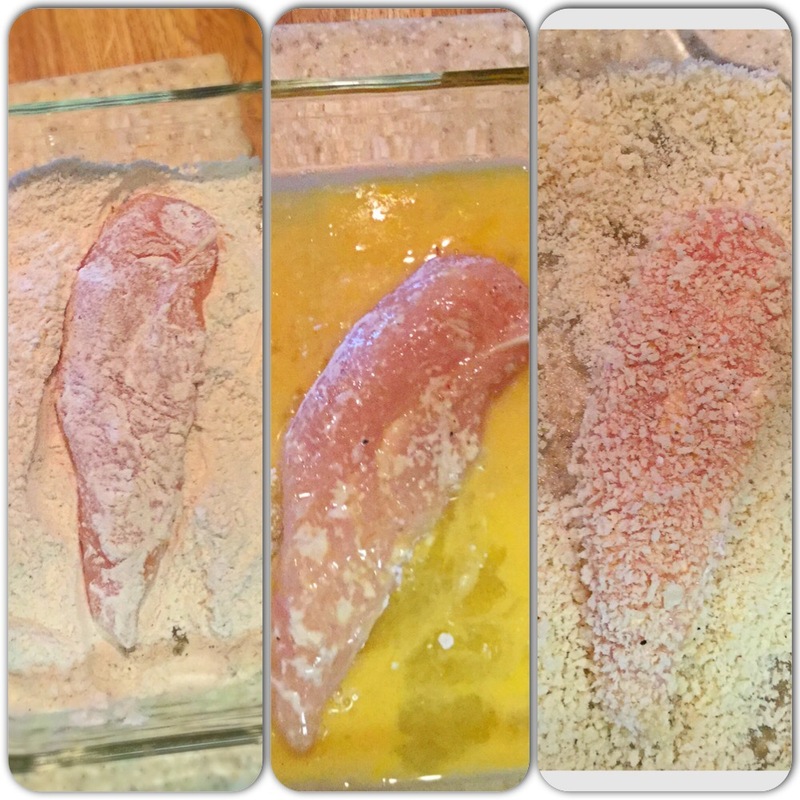 Going in order, dredge your chicken lightly in the flour, then the egg and finally the Panko. Set coated chicken onto a plate. In a large pan (preferably cast-iron) heat enough oil to come up 1/4 of the side to med/med-high heat. Add in your tenders a couple at a time. Do not overcrowd. 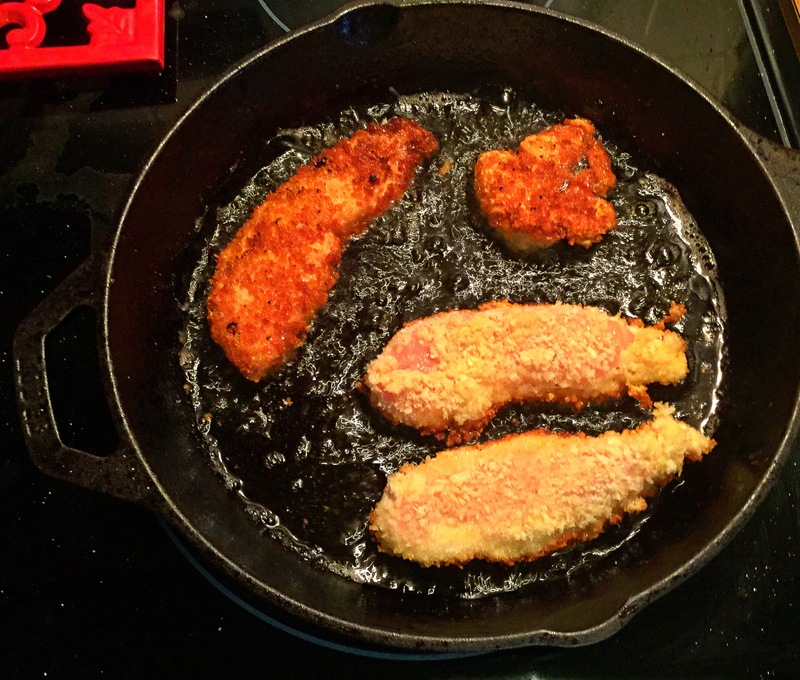 Depending on thickness, cook each side of tender for 2-3 minutes or until they’re a nice golden, crunchy brown! Set cooked chicken aside on a paper towel lined plate. Assembly time! 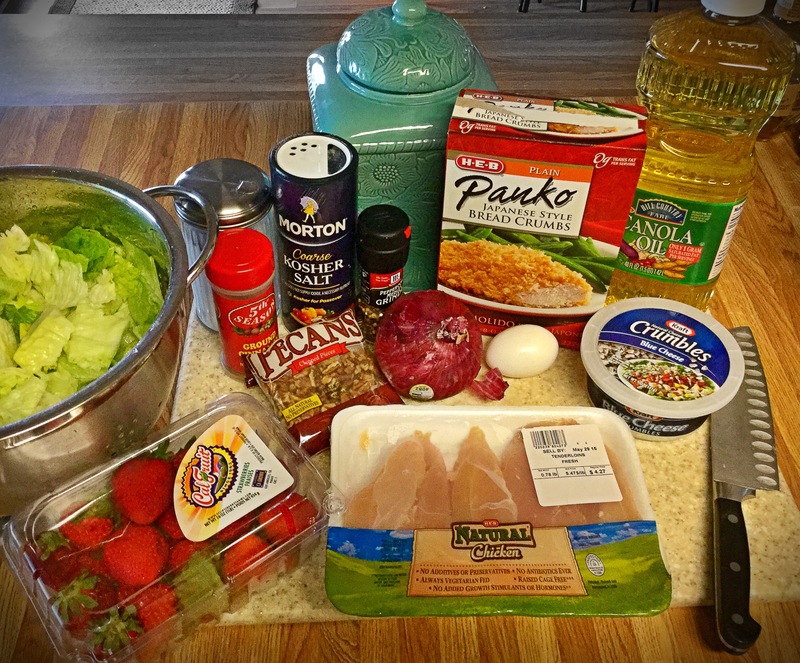 In a bowl, layer your lettuce along with the strawberries, cucumbers and onion. Slice your chicken and place on top. 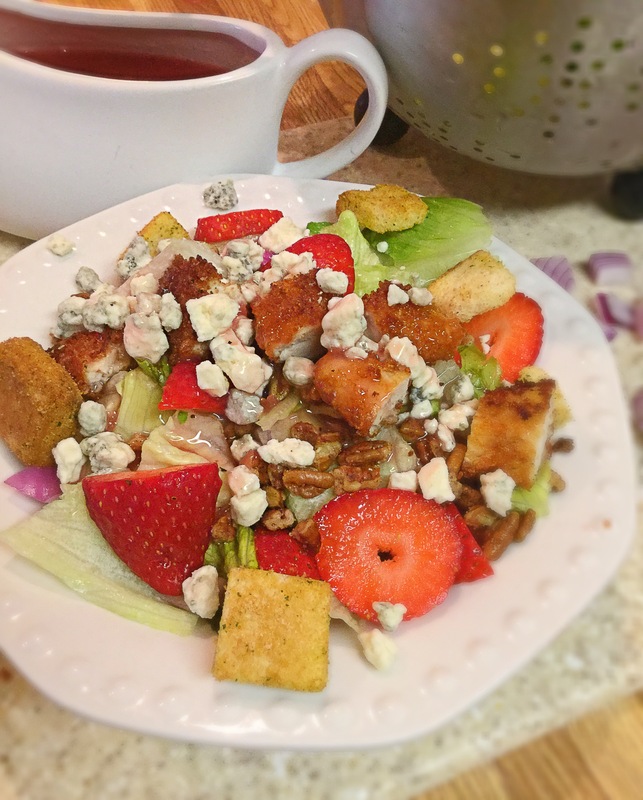 Sprinkle with Bleu cheese crumbles and the pecans and a bit of the raspberry vinaigrette. I like a few crunchy croutons as well myself. Enjoy this sweet, tangy, crunchy and refreshing salad…it’s delightful!